After a long career as an attorney for a large insurance company. 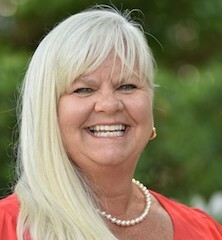 Cherie became a realtor in Charlotte, North Carolina in 2001. Since buying a home on Kiawah Island in 2014, she has expanded her career to include service to sellers and buyers in South Carolina. Cherie enjoys the island lifestyle and weather, especially since she was born and raised in Minnesota. She teaches water aerobics, and also spends time on the beach, on her bike, and with her bichon/chihuahua, O'Malley. She also has years of experience as a professional mediator, and as a guardian ad litem. Her varied background and familiarity with the islands - she and her husband honeymooned in a Greenslake Cottage on Kiawah in 1987 - provides her clients with personal, professional and expert service on the way toward reaching their goals.